Have you ever been curious as to why you smile at a dog every time one walks past you on the sidewalk? Do you notice that after you come home from a long, stressful day at work and play with your pet, you are in a better mood? It turns out that all pets, not just therapy pets, can boost your mood in many ways. While it’s easy to notice the wet kisses, purrs, and wagging tails, some benefits of owning a pet may go unnoticed. Below are five benefits having pets can have on your overall mood. Studies conducted by the American Heart Association (Levine et al., 2013) indicate that being in the presence of an animal, whether it be a cat, dog, bird, fish, etc., lowers our blood pressure. Levine e. al. (2013) has also found that pet owners have significantly lower blood pressure and heart rates before and after undergoing stressful tasks. Touch and movement are two healthy ways to manage stress; therefore, petting your pet lowers your heart rate and reduces your anxiety naturally. Pets are a great source of comfort and support. According to a special report from Harvard Medical School (2015), companionship has been shown to prevent illness and can even add years to your life. On the other hand, solitude and seclusion trigger symptoms of depression. Caring for and coming home to a living animal who is excited every time they see you immediately makes you feel loved, needed, and appreciated. It feels good to be loved regardless if you mess up at work, fail an exam, or are in a fight with your significant other. Pets require a regular eating and exercise routine. Having a consistent routine keeps an animal balanced and composed, and it can work for you as well! No matter your mood, once you see your dog hungry or begging for a walk, you can’t say no. In turn, you begin to wake up at the same time to let the dog out/feed them, take them on regular walks, and you begin to have a schedule for yourself which is good for your mental health. Being present and engaged with your pet takes your thoughts off of the issues that refuse to leave your mind throughout the day. Just like watching a movie, journaling, coloring, or reading a book, when you are fully engaged in playing fetch with your dog, you are completely present. You are not worrying about the past or the future, it is just you and your pet enjoying each other’s company. Along with buying that adorable ball of fur comes great responsibility. According to the research conducted by Stephen Ilardi (2009), psychologists claim that self-esteem is acquired when we take ownership of a task, apply our skills to a job, and when we succeed. When we have successfully given our pets another day of life, we prove to ourselves that we can care for another being outside of ourselves. Being responsible for another makes us feel needed and capable. 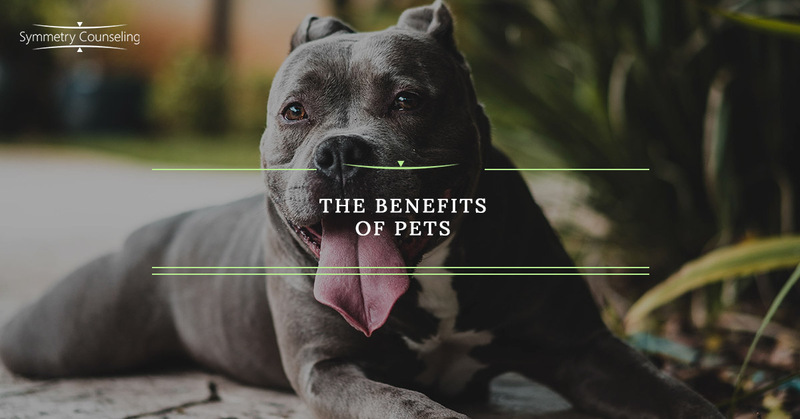 If you would like to know more about the benefits pets can have on your mental health and would like some guidance, it may be useful to connect with a therapist. Contact Symmetry Counseling to set up an appointment with one of our highly skilled therapists at one of our two Chicago locations.